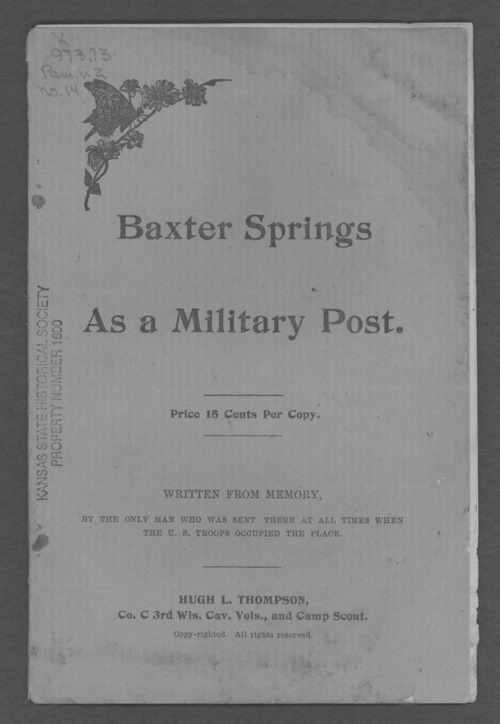 This pamphlet recounts the history of Baxter Springs, Kansas, as military institution during the Civil War. It also describes the murder of the Rev. John Baxter for whom the town was named. It describes the attack on General James G. Blunt and his forces at Baxter Springs on October 6, 1863. The author, Hugh L. Thompson, wrote the account from memory and claimed to be the "only man who was sent there at all times when the U.S. troops occupied the place." Thompson was a member of the 3rd Wiscosin Cavalry Volunteers, Company C.